The Device Summary page displays a summary of the device, including operating system, IP addresses, user-defined fields, device status, and lots more. Depending on the device type, some information or sections on this page may not be available for the device. Hover over the Actions button to perform various actions on the device. For further information, refer to Action bar icons. Hover over the Remote Actions button to take a screenshot of the device or connect to it. For more information, refer to Remote Actions. View in Autotask This button is displayed if the Autotask PSA Integration is enabled and the Datto RMM device is synced to PSA. Click the button to access the mapped configuration item in PSA. If you were already logged into PSA or single sign-on is configured for you, you will be directed to the Edit Configuration Item page. If you are not logged into PSA, you will be required to enter your login credentials first. For more information, click the question mark icon in the upper right corner of the Autotask PSA page. You will automatically be directed to the appropriate topic in the PSA Online Help. Device not synced This button is displayed if the Autotask PSA Integration is enabled but the Datto RMM device is not mapped to any configuration item in PSA. If the Autotask PSA Integration is not set up or is disabled, no button will be displayed. For information about the integration, refer to Autotask PSA Integration. The fields displayed in this section vary depending on the device type. To see more device details of Agent devices, ESXi hosts and mobile devices, click More... at the bottom of the Device Information section. This will direct you to the device's Audit tab. Refer to View audit data at the Device level. 1 In the case of network devices, values are only displayed for Cisco devices. Depending on the device type, some device information can be updated manually. Hostname ● ● ● Click Edit to update the device's hostname, then click Save. Description ● ● ● ● ● Click Edit to update the device's description, then click Save. This field has a limit of 256 characters. You can also have the Agent update the device's Description field. The process is identical to the one used for UDF data update. For more information, refer to Populate user-defined field information by the Agent. ESXi Credentials ● Click Edit and select the correct ESXi credentials from the list, then click Save. Site ESXi credentials will be displayed in addition to ESXi credentials specified in Account Settings, unless this option is disabled in Site Settings. For information on how to store ESXi credentials, refer to Account Settings and Site Settings. SNMP Credentials ● ● ● ● Click Edit and select the correct SNMP credentials from the list, then click Save. 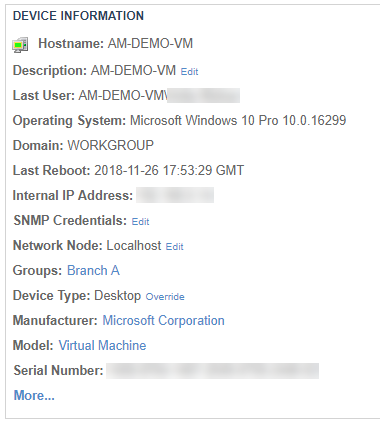 Site SNMP credentials will be displayed in addition to SNMP credentials specified in Account Settings, unless this option is disabled in Site Settings. You can also choose any of the Default SNMP Credentials (v1 and v2c, public) listed here. In case the SNMP credentials set in Account Settings or Site Settings are deleted, the Default SNMP Credentials will be used automatically. For information on how to store SNMP credentials, refer to Account Settings and Site Settings. Network Node ● ● ● ● Click Edit and select a network node from the list, then click Save. All network nodes of the site that the device belongs to are displayed. Devices that can have an Agent installed also have an option called Localhost because these devices will attempt and be able to monitor themselves. Devices that cannot have an Agent installed and therefore cannot monitor themselves will have an option called Unassigned. For more information about network nodes, refer to Network discovery. When you move a device to a different site, its network node assignment will be cleared. Device Type1 ● ● ● Click Override and select a device type, then click Save. Power Rating ● ● ● Click Edit to update the device's power rating, then click Save. For further information, refer to the Power Rating section in Account Settings and Site Settings. (in the Status section) ● ● ● ● ● This field is not populated automatically. Click Edit to update the device's warranty date. Select the date (YYYY-MM-DD), click Done, and finally, click Save. Alternatively, you may consider using a third party integration to populate this field. If either the Autotask PSA Integration or ConnectWise Manage Integration is enabled, this information is only synced to your PSA if it is not in the PSA at the time of synchronization. 1 The device type of ESXi devices and printers cannot be overridden. Incorrectly assigned devices should be deleted and re-added. 1 Unlike regular Agents, mobile devices don't have a persistent connection to the platform. They only display an online status when they are being audited. 2 Click the number to open the Device > Monitor > Monitor Alerts page. Refer to Manage alerts. 3 Click the number to open the Device > Support page. Refer to Manage tickets. 4 Not populated automatically. Expired status is displayed the day after the device's warranty expires. For information on how to update this field, refer to Edit device details. 5 Only available for Windows devices. 6 Click the hyperlink to open the Device > Manage > Patch Management page. Refer to Patch management at the Device level. 7 Only displayed for Windows and macOS devices. Click the hyperlink to open the Device > Manage > Software Management page. Refer to Software Management at the Device level. 8 Refer to Antivirus management. Click the Refresh icon to refresh the current view of the device. The Refresh icon does not display for offline machines, ESXi devices, network devices, printers, and mobile devices. In some cases they do not display at all, e.g. due to incomplete audit. Once it has been saved, you can edit or remove it by clicking on the Edit Note icon or the Delete this Note icon . You can also add a note to the device through the Agent Browser. For further information, refer to Connect to a device. This section is on only available for printers to show toner information. The following fields are displayed: Description, Remaining, Status. User-Defined Fields 1-10 only become visible if they have been populated with information. Click the Edit icon to update any of the fields. To find out more about user-defined fields, refer to User-defined fields, Account Settings and Site Settings. This section is only available for Hyper-V-enabled devices and ESXi hosts. The following fields are displayed: Hostname, Guest Name, Operating System, Status. Without a Datto RMM Agent installed on the virtual machine, this section shows limited information. This section displays all monitors applied to a device that can show real-time data, whether the monitor is applied at the Device level or is part of a monitoring policy. Real-time monitor output makes it easier to check if the monitors are working properly. This section is available for the following device types: server/desktop/laptop, ESXi host (for SNMP monitors), network device, printer. Show entries Select to show 10 / 25 / 50 / 100 entries per page. 25 is selected by default. Search A dynamic search field that lets you search for monitors. As you type, the search results are narrowed to match your search string. Monitor Displays the Monitor Type and Description. You can click the column header to sort by this set of data. Click the hyperlink to open the Monitors page (in the case of standalone monitors) or the monitoring policy that the monitor is part of. For more information, refer to Manage monitors. Priority For more information, refer to Manage monitors. With the exception of Last 30 Metrics, click on any of these columns to sort the data. Previous / Next Click a page number or click Previous / Next to see the previous or next page of results. This area lists the most recent activities that have been carried out on the device. To see all of the activities on the device's Audit tab, click Show All and refer to Device activity. This section is available for the following device types: server/desktop/laptop, ESXi host. The scale can be changed from 24 hours to one week or one month. The performance graphs are updated at the time a device submits audit data.